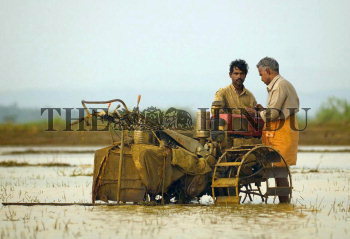 Caption : Farm workers ploughing in a paddy field near Thrissur in Kerala on Tuesday. Clearly, increased farm mechanisation is a key step towards better rural prosperity. However, farm mechanisation in India is in the initial stages of development and dominated by use of tractors and tractor mounted implements. While the Indian tractor market is highly organised and among the largest in the world, the farm equipment market is dominated by unorganised players accounting for more than 50 per cent of market share. Photo: K_K_Mustafah 16/03/2010.